Do you like music? Then it’s time to feel the groove with Just JAM. Pick up that Wii Remote controller and get ready to mix, match and lay down your own tunes. Move it, shake it and rock the house as you control the entire band. 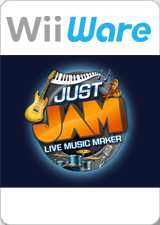 Just JAM offers a live music experience featuring your favorite genres and cool artists, including pop, rock, techno, alternative and hip-hop tracks to get you on your feet. The graph below charts the compatibility with Just Jam since Dolphin's 2.0 release, listing revisions only where a compatibility change occurred. This page was last edited on 15 January 2018, at 04:57.